Chansky’s Notebook: Hooray For ‘Hoos! Virginia atoned for a heartbreak it really didn’t deserve. Yes, the Cavaliers were the first No. 1 seed to lose to a 16 a year ago, but when you study that 20-point loss it wasn’t such a shocking upset that put UVa on the path to redemption. No question, it was embarrassing to lose to Maryland-Baltimore Country in a game that school will never forget. Virginia had a great year, winning both the ACC regular-season and tourney titles. But it wasn’t winning it all in 2018, regardless. Sophomore De’Andre Hunter, hero of the Final Four the Wahoos won last night, didn’t even play in that game. The Retrievers shot 54 percent from the floor and 50 percent from 3-point range, out-rebounded Virginia and won going away, proving they were the better team that night in Charlotte. Tony Bennett’s kids were heartbroken, but the squad he had coming back proved so much better and capable of winning the national championship even without the incentive they had to erase that unprecedented defeat. Hunter developed into an All-ACC player and first-round NBA draft choice whether he chooses to turn pro or not. Kyle Guy and Ty Jerome were even better as juniors, and will likely stay to play their senior seasons… curses! And the Cavs had a vastly underrated freshman point guard who allowed Jerome and Guy to play without the ball and get more outside shots and driving lanes. Last year’s starters Devon Hall and Isaiah Wilkins combined to score 9 points and shoot 4 for 16 against UMBC. 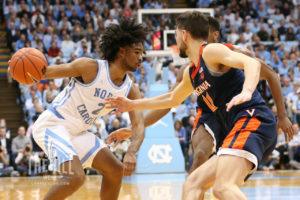 Compare that to Hunter’s 27 points, including four 3-pointers, and 9 rebounds; emerging Mamadi Diakite’s 9 points, 7 rebounds and two blocks and newcomer Braxton Key’s 6 points, 10 rebounds and blocked shot that assured the final game was going to overtime, where the Cavs made 12 of 12 from the free throw line to finally put away tenacious Texas Tech. So let’s celebrate Virginia’s deserving first hoops national championship, earned through three straight heart-stopping victories, giving the ACC its third different NCAA champ in the last five years. The ‘Hoos had the heart to redeem themselves, for sure, but had the players who made the plays on the court, which was far more important on the scoreboard at the end.